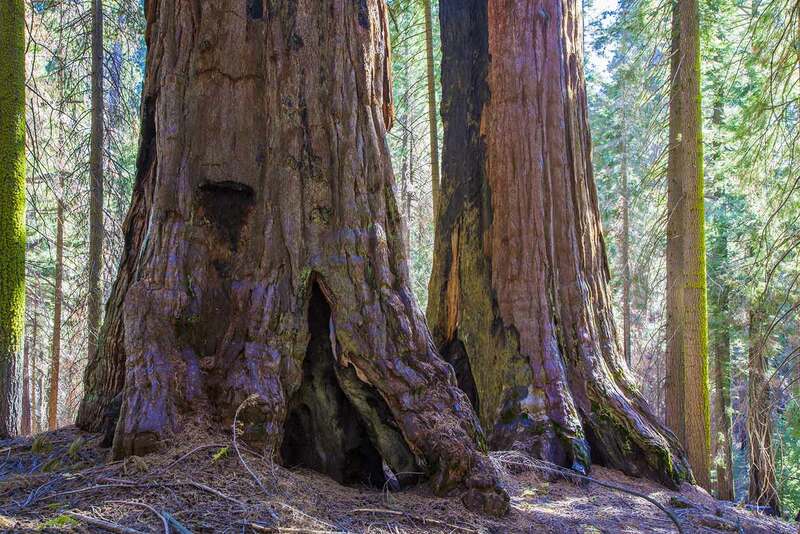 The Redwood Mountain Grove is the world’s largest sequoia grove and, though partially logged, it still has more old growth than any other grove. It’s also quite impressive, with no shortage of mammoth trees throughout. Admittedly the Giant Forest is even more impressive (because the sequoias are packed closer together), but as a result it’s also crowded in places and heavily developed. 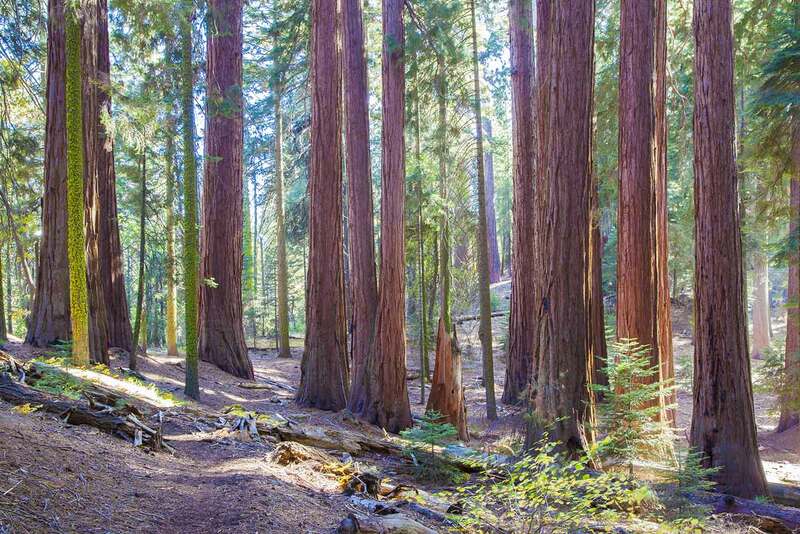 Redwood Mountain stands out because it’s still in pristine wilderness condition, and even on a holiday weekend you might encounter another hiker once or twice an hour. The grove has three trails. The central trail, the Redwood Canyon Trail, is the least interesting; the understory is so dense that it’s hard to appreciate the sequoias. 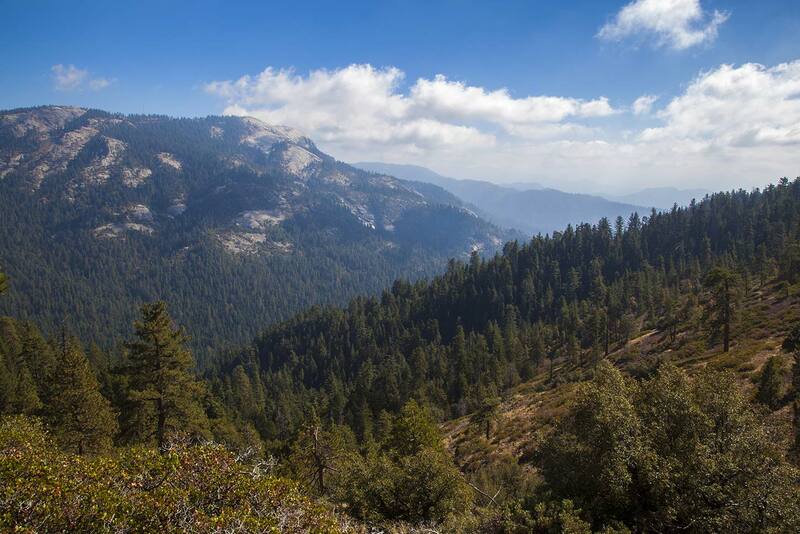 The route described here combines the two best trails into a single all-day hike that includes a nice variety of woodland, from the dense, lush forest along Redwood Creek to the open sequoia forest on top of Redwood Mountain and on the middle section of the Hart Tree Trail. 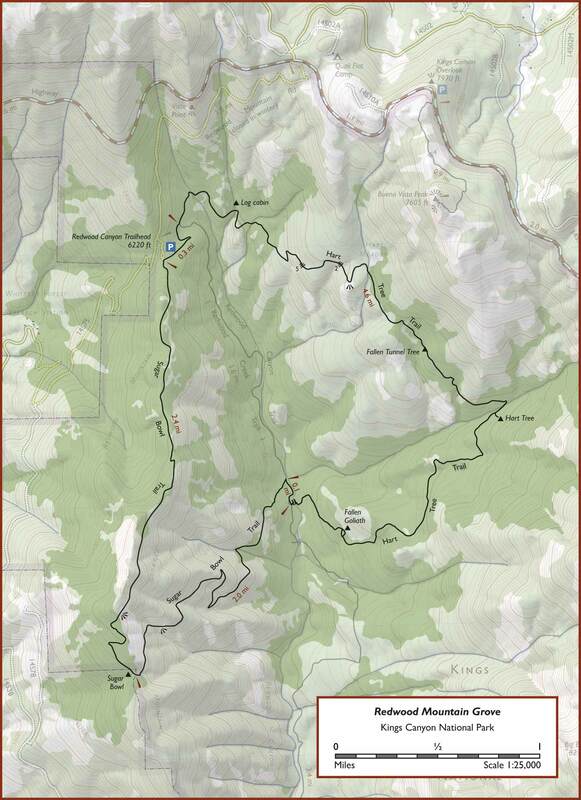 The best part of the Redwood Mountain trail system is the two-mile stretch of trail that leads along the ridgetop from the parking lot to the Sugar Bowl. This is an excellent option if you just want a short hike. This stretch of trail is especially photogenic in the late afternoon, since the ridgetop is perfectly lit by the setting sun. 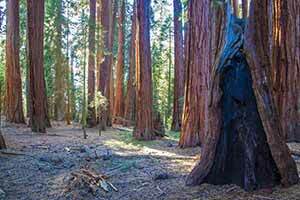 The trail is reached by a bumpy two-mile-long dirt road that runs through old growth. The road is only open in the summer, usually from Memorial Day weekend until October or early November. 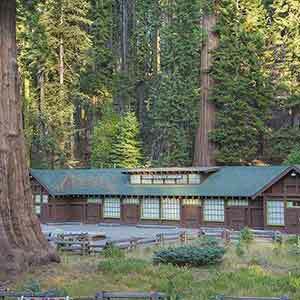 Turn left at the first intersection to reach a good-sized dirt parking lot surrounded by sizable sequoias. 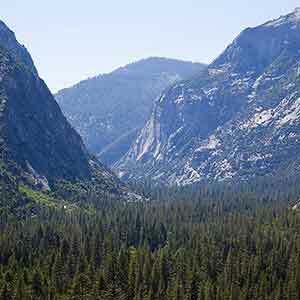 The trail gets off to a good start, descending through dense, lush woodland studded with large sequoias. 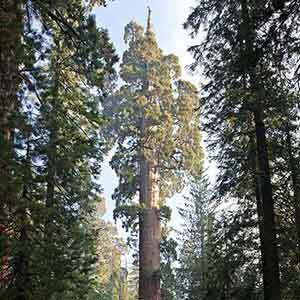 An especially impressive collection of big trees grows around the intersection with the Redwood Canyon Trail. The trail then passes four huge stumps, the only really noticable signs of logging on this hike. This is Barton Post Camp. The sequoias peter out after the Log Cabin (which is actually just a hollow log with a sleeping platform inside) and the trail climbs through mundane forest for a while. The forest has the sparse, open canopy typical of the area and gets progressively more open as the trail climbs. 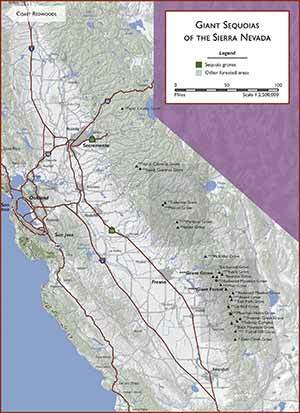 There’s a nice view of Redwood Mountain; the nearby ridge is covered with huge, distinctivly round-topped sequoias. After the trail crests a hill, the scenery improves dramatically as the trail starts descending through an exceptionally attractive sequoia grove, with light-colored giants standing individually or in small scattered groups among the pines. 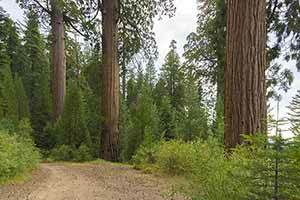 There are quite a few sequoias with strikingly stout, perfectly cylindrical trunks in this area and the understory is very open, yet the area has a pleasingly lush appearance. After the Fallen Tunnel Tree the woods gradually become denser and less attractive. 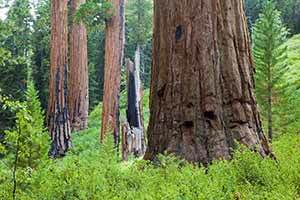 There also seem to be fewer sequoias, or perhaps they’re just hidden by the smaller trees. But the biggest sequoias of the hike are on this section of trail. The trail passes a small waterfall at a creek crossing, and shortly afterward there’s a short side trail to the huge Hart Tree. The trees get even bigger as the trail descends, although the woods become dryer-looking and less attractive. The trail ends at a especially lovely little flat. It’s easy to miss since there aren’t any big trees right next to the trail, but if you stop and look around you’ll be rewarded with the sight of big trees in all directions, especially some immense monster trees rising through the canopy in the distance. The sound of a burbling creek fills the magical little glade. The trail kind of disappears at this point, but you have to cross the creek. There’s a somewhat hazardous-looking log with some steps, or you can descend into a little gully and wade throug the creek. The creek is only a few inches deep, but it’s too wide to step over. 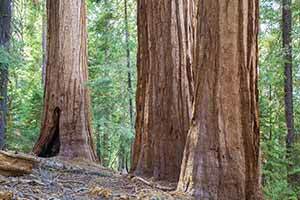 The Hart Tree Trail ends immediately after the creek crossing, at the Redwood Canyon Trail. Turn right onto the Redwood Canyon Trail, which is noticably busier than the Hart Tree Trail. The very pleasant trail climbs gently through a wide, lushly-vegetated valley with the trickling, dogwood-lined creek nearby. 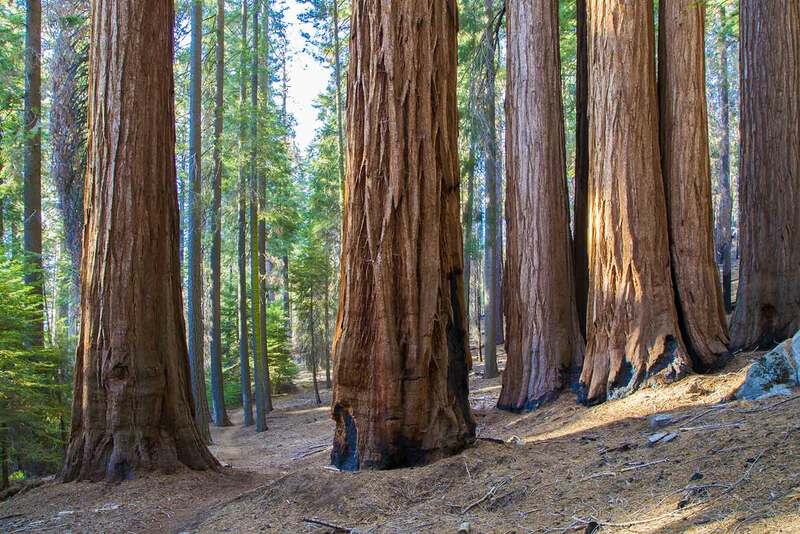 There’s also a remarkable collection of huge sequoias in this area. Turn left onto the Sugar Bowl Trail. The trail is narrower than the other trails and a bit overgrown in parts, but it’s never been difficult to follow. 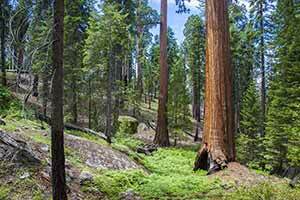 It quickly leaves the sequoias behind and climbs, first through oak woods that gradually become more open, then through shady pine groves. The trail offers some nice views of Big Baldy, and gets slightly rocky near the ridge. As recently as 2012, Big Baldy was covered in a solid green carpet of conifers. Now about a third of the trees are dead grey husks, victims of drought and the ensuing bark beetle infestation that has affected the entire Sierra Nevada. A lot of the trees by the side of the trail are dead, too, especially the perfectly-cylindrical ponderosa pines. The sequoias haven’t really been affected yet, though. 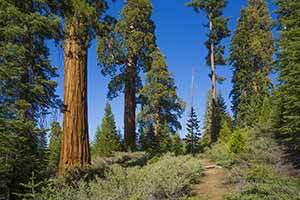 The Sugar Bowl is a small sequoia grove in a shallow depression maybe 100 or 200 yards across. The Bowl doesn’t have any really big trees, but it has the unusual distinction of consisting entirely of sequoias. Normally it’s unusual to see more than 5 or 6 sequoias growing together, so this is quite a sight for anyone familiar with sequoias. The bowl doesn’t have any groundcover other than a thick covering of pine needles, and it’s completely silent except for the buzzing of flies and the occasional woodpecker. During the day the Sugar Bowl can be a little dull-looking, since all the trees are the same color. However, in the very late afternoon the trees are backlit by the yellow light of the setting sun and the grove is much more striking. After the Sugar Bowl, the trail continues to meander through an unusually dense and scenic collection of sequoias for another quarter-mile. While it doesn’t have the unique look of the Sugar Bowl, this part of the grove still has an unusual density of sequoias and an open appearance with little groundcover. The trail leaves the sequoias and breaks out into the sunlight, offering the best views of the hike, across and down Redwood Canyon. Big Baldy rises on the other side of the canyon, and the craggy peaks of the Great Western Divide can be seen in the distance. The stretch of trail from the Sugar Bowl to here is both the scenic and the actual high point of the hike. View from the Sugar Bowl Trail of Redwood Canyon and Big Baldy in 2012. Click for another view of Big Baldy showing the dead trees in 2018. The scenery becomes a little more mundane as the trail descends through a stretch that doesn’t have any sequoias. 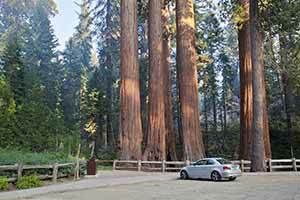 It then comes to a small saddle where a true behemoth sequoia grows on a slight rise opposite a collection of smaller sequoias. This is the last really big tree on the hike. It’s worth walking around to the back of the tree to get a better view of the stout trunk with its immense branches. After another stretch without any sequoias, the trail descends through a pleasant area of mid-sized sequoias for its last mile. These sequoias all have remarkably similar rough brown bark. Here are a few more photos from the Redwood Mountain hike. This thread on BackpackingLight.com has lots of pictures from a winter hike of the Hart Tree Loop. 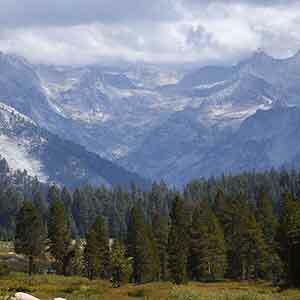 Mike White’s book, Kings Canyon National Park, has descriptions of the Redwood Mountain and Sugar Bowl loops. Another book by Mike White, Top Trails Sequoia and Kings Canyon: Must-Do Hikes for Everyone has shorter descriptions of the Hart Tree and Sugar Bowl loops. Jason Kim’s account of a winter visit to Redwood Mountain: part one; part two.